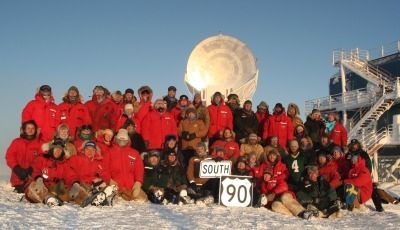 Back at the Pole for three weeks now, the station closed on Sunday the 18th of February and we are 54 this year. 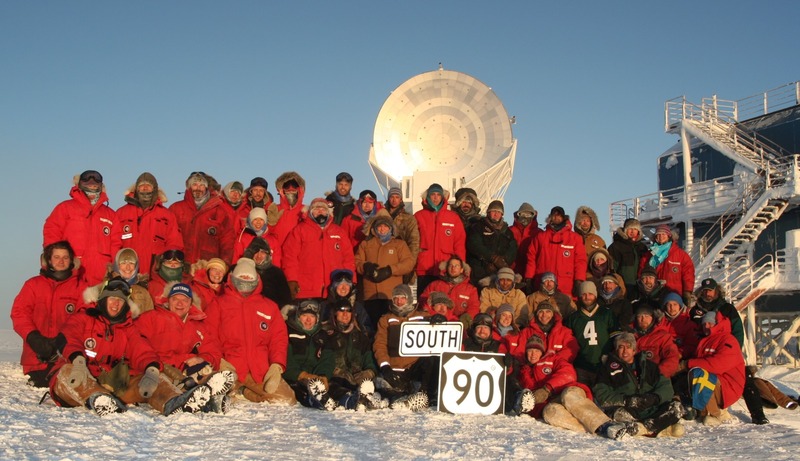 Another winter at the Pole. A few more days and we will start our CMB observations again and I will shift back to a night schedule. At the moment we would still see the sun in our data, so we are looking at brighter sources. Bill Spindler is the (un)official South Pole historian and has a very interesting webpage about the history of the South Pole. 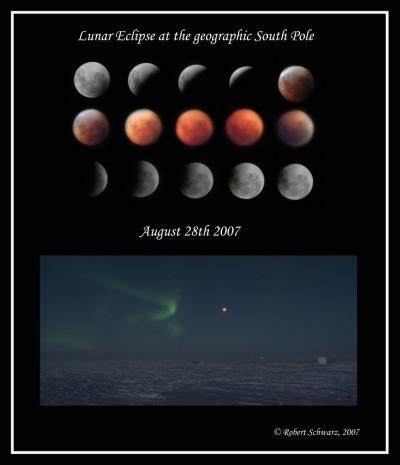 In the last years he also made the South Pole Winterover statistics. This year marks a record for me with 6 winters at the Pole, nobody else has done that yet, but it will be just a question of time, since in the last 10 years I'm coming down here it started as a trend and most of the winter-overs with more than 4 winters have done it in this period. The sun is getting low and will be gone in a week. We settled into our winter routine. I switched back to nights because the run end and fridge cycle for our telescope is getting earlier by 4 min. a day and since I can't manage to go to bed earlier every day I just stay up now and go to bed around noon once the fridge cycle is finished and we start a new observation run. Like 2 years ago we started the "Race to McMurdo" again - the distance are 840 miles and the idea is to give you a goal for your workout (ok McMurdo is not the best goal where you would like to go from here, but everything else is much further away ;) ), so for example running on the tread mill is what ever you run, 1 hour on one of the Schwinn spinning bikes counts as 6 miles. I just reached the first 100 miles. But I can only stay on the bike if I watch a movie, outerwise it is way to boring. Last Saturday we had a wine tasting featuring 5 new Australian red wines combined with delicious food. Another mix of pictures from March so far. Equinox, i.e. the center of the sun is passing over the equator. For us it is sunset, but due to the refraction in the atmosphere we are still able to see the sun for a few more days. But the colors in the sky are changing quick now. 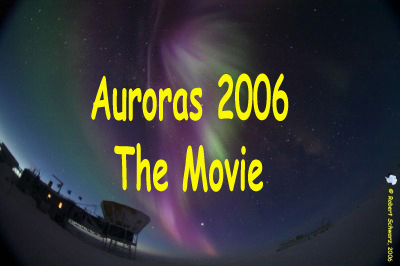 Finally I managed to upload my aurora movie from last winter. To download it you will need a fast connection, because the file is 160MB, but it will give you an idea how spectacular the auroras are down here, even during a solar minimum year. Tonight we had our big sunset celebration of course with a delicious dinner. The sky cleared up well enough to see the last rays of the sun. Depending on the weather we might get a glimpse for 2 more days. Now my favorite time starts outside, the sky will be different every day and in about 3 weeks it will be dark enough to see the auroras. The different stages of twilight that last for about one hour at normal latitudes will last about 4 weeks here. It's getting darker every day, but still enough light to do some groundhandling. The wind has to be around 12kts. Besides the -65°C you are getting quite warm and it is a good workout only your hands need a few hand warmers to stay warm. Last years groundhandling helped me a lot for the strong wind conditions I experienced in South Africa this year. But the little jumps are as good as it gets down here, but still a lot of fun. Here is a short movie clip (12MB), thanks Brien for taking all the pictures and freezing your hands. Already April and it's getting quite dark, we passed civil twilight and are in the middle of nautical twilight. The Southern Cross is visible and every day more stars are appear. All the station windows are covered now since we are running light sensitive experiments. The plain covers are just boring so we have for the second time a Galley Gallery where the windows are decorated. We got some great windows again :) and it will be fun to look at them over the next few months. Some are funny, some give useful information some are just artsy. Time is flying, and before you know it one week after the other is over. 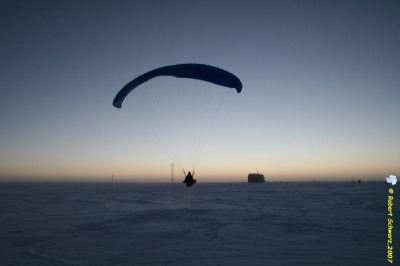 The race to McMurdo is in full swing (see above) and we got some good Volleyball going this year again. To have a full size gym makes all the difference in the world. It's dark now and we can see the milky way and also had some nice auroras already (stay tuned for new pictures). Today we had the 3rd BF5k race. It is a 5km race in the hallways of the new station, you have to show up in a costume and provide a sponsor who keeps track of how many rounds you did and has to drink a beverage of his/her choice for every 3 laps completed. Again there were some great costumes and themes, I was part of the astronaut-diaper team - remember the incident at the beginning of the year ;), one of my favorite teams was the Peter Pan team, but also the silence of the lambs team was awesome. Last weekend we had some great auroras - finally :) The sunspot number was pretty low for a while and the newest predictions for the solar cycle still put us in the solar minimum :( but we are so close to the aurora oval that we still can expect some great auroras, just the new pictures and the ones from the last years. After some delay the paper about the QUaD data from the first season is out, it is available for download here. Time is flying again, another month and it will be midwinter already. Everybody is now in the winter groove and I always find it amazing how quickly the weeks go by and some of the weekly tasks are coming up again and you would swear it wasn't a week ago, that you did it last time. The last week we had some good auroras, finally :) That means not as much sleep, but it's always worth it. I will post the May auroras once the month is over. We had quite a few birthdays in May and on Thursday we celebrated Kari's and Dave's, Zak's was just the day after and Sven's a few days before, also the semi finals of the South Pole Pool Tournament took place the same night. The Moon is up again and it is amazingly bright after a couple of weeks in the dark. But the last dark days we had some amazing auroras, I'm trying to make another movie so I took about 1400 aurora pictures in May :). The designs for the next years polemarkers were due today. The ice shifts about 10m a year, so the true geographical South Pole is surveyed every 1st of January, the new marker is designed the year before by the winter-over crew, like now we did the 2008 marker, once a design is chosen, Derek our machinist this year will spend quite a bit of time to produce this piece of art. Windy, windy, windy for about the last 10 days it is quite nasty outside, the wind never gets really high here (the highest ever measured here was about 45 kts), but a 20 kts wind makes quite a difference walking around outside, it cuts through your face mask and hats and after a few minutes you can feel some sore spots. Also it creates quite a bit of drifting and the ever changing sastrugies are getting bigger, some are soft, some a really hard and you trip several times on the way out, especially now since the moon is gone again for 2 weeks and if you would stand on the flagline to the dark sector you would hear quite a bid of swearing from the people passing by ;). Most of the time the star light is enough to actually see roughly your surroundings. Besides the wind is was still amazingly clear for the most days. Nearly all of our snow is carried in by the wind, there is very little to none real precipitation and if there is an obstacle snow will accumulate quickly around it. Lightning struck the downlink station in Florida for one of our main satellites so now we lost some of our much appreciated connection to the outside world again. Time is flying again and midwinter will be in less than a week, and the sun will start to return to our side of the world, not that we gonna see it for another 3 months but the real darkness will fade away in about 8 weeks. Yesterday we took a group picture to send out for our midwinter greetings the coming week. But taking test shots is so easy in the digital age, 10 years ago for my first winter-over picture I took about 100 test shots, but back then it was still slides, so you took about 10, went into the dark room, developed them and took some more - I love digital photography. 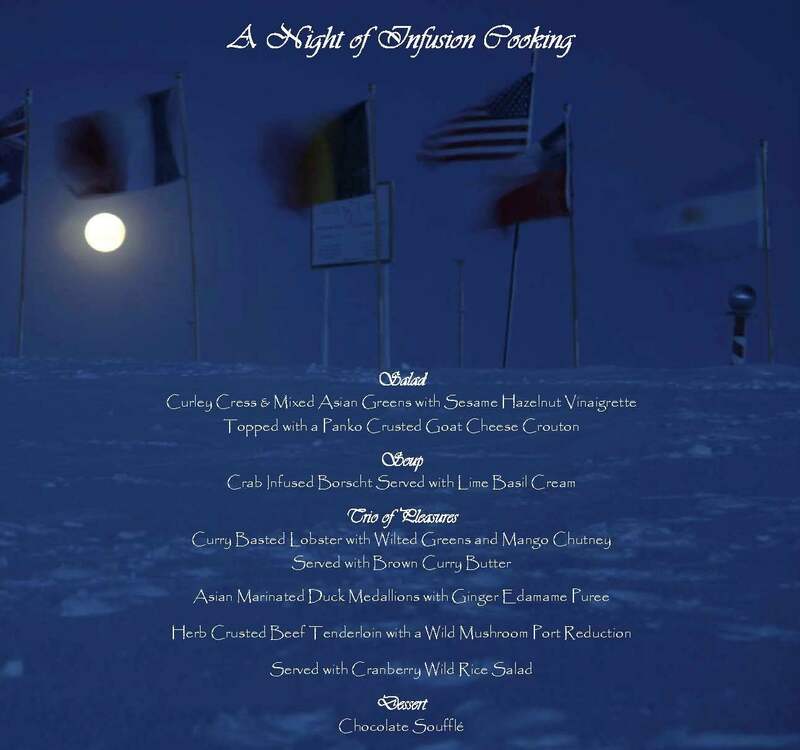 Solstice was on Friday the 22nd at 0608 NZT, that evening we had our big midwinter dinner, what an excellent meal, check out our menu. An old tradition is to send out midwinter greetings to all the other stations on the continent and of course invite them for the dinner (since everybody knows it is impossible) and we also get a letter from the White House every year. In the last weeks we experienced a few satellite problems, which cut down our internet connection, so it might take a while to upload pictures etc. The weather in July was much better than the previous months. 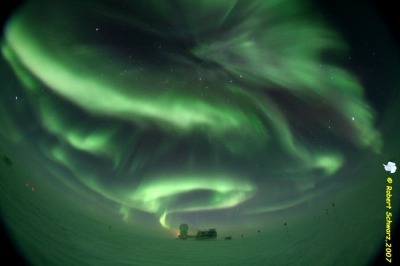 Although the solar activity was really low and we only had sporadic auroras. But there are 4 more weeks, where it is dark enough. So after some struggle and quite a bit of political BS we are on the air again, at least for a bout 7 hours per day, hope it lasts. The internet is a great thing for us to have down here, as you might can imagine since it is more or less our only connection to the outside world. That is one of the great things down here that you are not working in your own profession, but you learn and practice a lot of other things as well. With the clear skies the first faint glow of the sun is very obvious - if you are out for a while and your eyes are dark adopted. These pictures are exposed for over one min. so the camera is picking up much more light than your eye, you can even see some colors. It's getting a bit brighter every day. After months of darkness even the small changes every day appear quite impressive. One side of me is sad seeing the milkyway getting dimmer, seeing the last of the auroras... It's not like anywhere else where there is another night coming up in half a day, here it is final and you never know if you will experience it down here again. I finally managed to update the Picture of the Week. The weather is nasty for the last to days, a complete cloud cover and another heat wave with only -40°C. We like it as cold as possible and no wind, then we have the best clear skies for observations and something nice to look at. It's getting that time of the year to start making travel plans :). Last weekend I booked my first flights (Fiji, Bali, Singapore, Bangkok) and more to come. Today the first plane came to McMurdo station, as I said, glad we are down here and have our own station for a two more months. FIRE, FIRE, FIRE - if that is the case, we are our own emergency response, fire and medical we don't need a police ;) Before we come down here some of the crew attend fire school or get a trauma training. To keep up to speed we have monthly exercises and drills. This month was an MCI (Mass Casualty Incident). With our limited facilities and personal, two or more patients can be already considered a MCI. No one was hurt in the exercise, also the make up was quite real on the patients - just want to mention that, because I know a lot of family and friends of current winter-overs are looking at my page - so all is fine :) (MCI pictures). What a day, it started out with some incredible auroras, wow. It was amazing, unfortunately the sky is already very bright, especially with the full moon up. 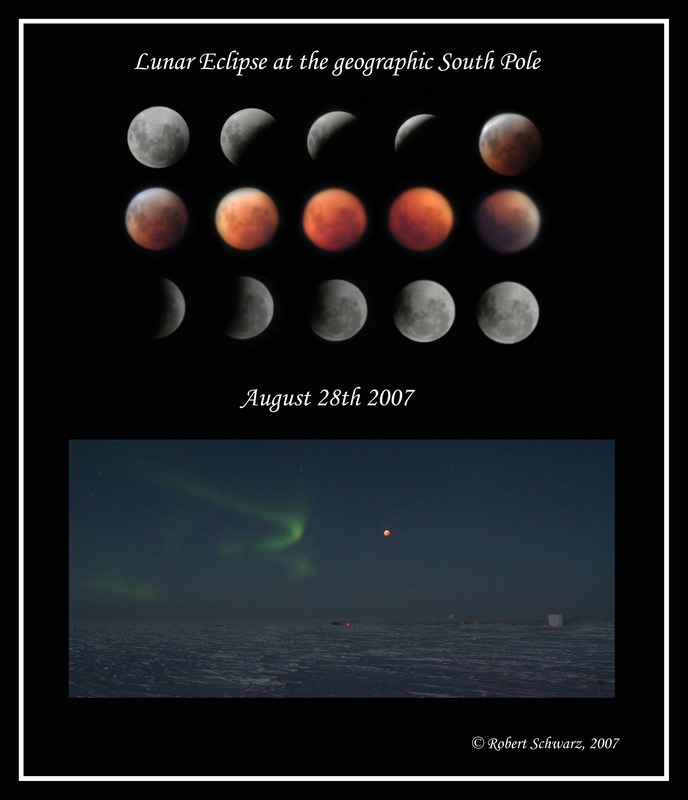 But it was amazing to watch and then we had the lunar eclipse to round up the day. The weather was great, some nice -68°C (about -90F). I wanted to take some special pictures of the eclipse. But I couldn't do it outside in these temperatures, so I used the room for the UV observations (Dobsons) in ARO our clean air facility. This is the only building on station with windows you can open. I built a camera mount for three cameras, I could place in the window and put some insulation up, to keep the heat in as good as possible. The pictures with the 300mm lens turned out to be quite blurry in the phase of the totality (the difference in exposure time between the full moon and the total eclipsed moon is about 15000 !!!) , but then the moon was quite low (about 10°), so we are looking through a lot of atmosphere, in a few seconds exposure time you can already see the Earth's rotation at this focal length and then of course I wasn't in an optimal spot but the only possible one for taking the pictures I wanted to. A heated room on one side and outside temperature on the other side - so there is quite a bit of air movement and that shows up on longer exposures. Here is a picture I put together quickly last night, but there are some more. Here is the picture, I had in mind when I was thinking about the eclipse and I'm very pleased with the outcome. 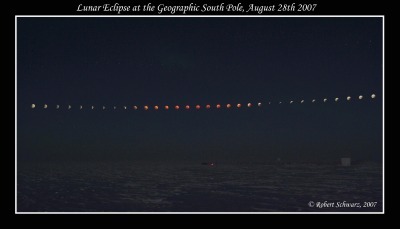 It's a composition of 32 single images at the according exposure times to get the moon exposed correctly. I used the GIOTTO software for the first time to combine the single images. It also shows nicely how the moon moves across the sky here, the moon is up for 2 weeks at a time and during the 6 months without the sun it seems very bright. I submitted the first picture (I like the 2nd one better, but it took me another day to finish) to spaceweather.com which I visit every day to get an idea on the sun activity and the chances for auroras (at least as long as it dark). They put it up on their page. Here is a picture of the actual site, since I like the comment as well. And thanks for all the nice comments and entries in my guestbook and the emails. I just checked my website stats and they skyrocket with a factor of more than 20, wow :) - well thanks for visiting. The stars are fading, well all except one, whose fault it is that all the others are fading and now it is too bright for auroras - too bad. But the nice red and orange horizon is also spectacular to look at. Thanks again for all the guestbook entries, it's really fun to read them. 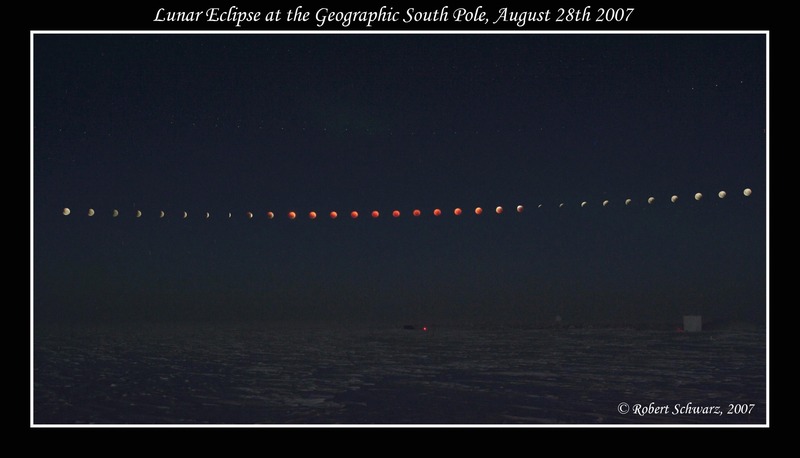 Today's Astronomy Picture of the Day will feature the multiple moon eclipse picture. The last weekend we had a terrific storm, with big snow drifts and poor visibility. If it clears up we might see the first glimpse of the sun. I added the August auroras as well as some pictures about the changing twilight and the storm. The Sun is up. 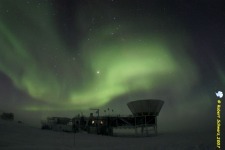 On Friday the 21st it cleared just before midnight and we saw the first direct orange glow at the horizon. This evening we had our sunrise dinner, but first it didn't look like it we will see it. The following days it was nice and clear and it is such a difference again to see shadows on the ground. These are still very long since the sun is just above the horizon, but will gain slowly a bit more elevation every day. Today nearly everybody ventured out to the new SPT to take our winter-over picture. It was a nice day, but still cold and breezy and a few got a bit of a frostnipe on their faces while posing for the pictures. It's October, the sun is up and you would think it's getting warmer, far from it :). Last Friday we had the coldest day in October ever recorded. The temperature dropped to -72.1°C (-97.8F). Since we only reached -100F for 2 min. 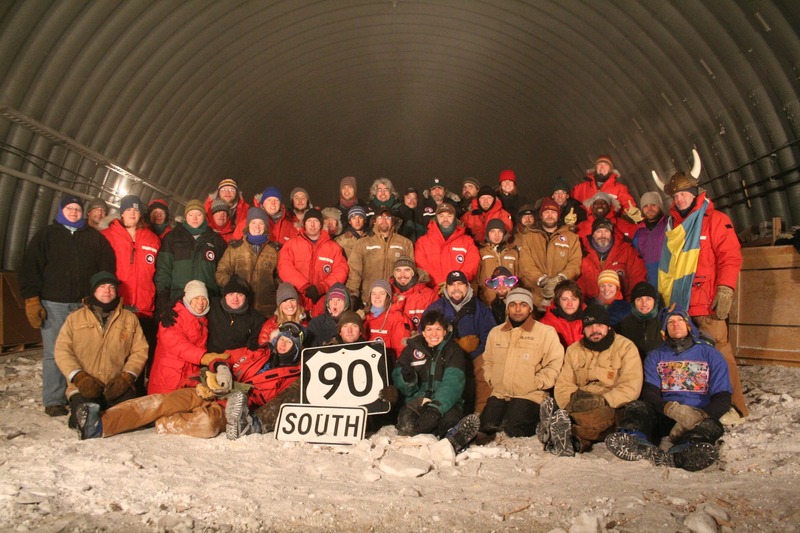 during winter, some desperate souls went out for the 296 club (it was -96F at that moment), not quite enough for the 300 club but pretty close (read more about the 300 Club in previous years). Of course what would be October without Oktoberfest :) so as every year I was down here, we celebrated the biggest beer fest in the world down here as well. My guestbook provider ceased to exit, therefore I got a new guestbook. The old entries are now here. The Twin Otter was stuck here for a few days, whereas the Basler took off after 30min refueling. The Basler came back today with the first summer people, but since it can carry only about 15 or so it is a nice transition form winter to summer, much nicer then getting 120 people dumped on you in a few hours. Two of our winter-overs left on this first flight and will be in NZ by tomorrow night, happy travels. A second Basler made it in on Friday, but since then the weather is not too good so station population is only at 83, but soon it will more than double. 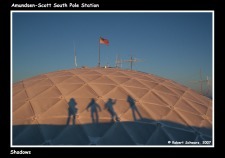 The summer hectic is back and South Pole is a busy place once more. Unfortunately I lost my entry I wrote a few days ago, so I will try again. The soft opening was actually very nice compared to being swamped by 120 summer people on the first day. The first big group of winter-overs left on one of the first LC-130s, but the next bunch who was supposed to leave on the 1st and 3rd wasn't so lucky and there were no more flights until the 8th. On Monday the 5th it actually got close and one plane was circling already over the station, two more enroute, but the visibility was terrible at Pole and McMurdo weather rapidly deteriorated so all planes were recalled to Mctown, but only 2 of them made it back, the last one had to be rerouted to the Italian Station at Terra Nova Bay. There were some long faces here when the plane circled but didn't land, luckily they made it out on the 8th. Then there was only a handful of us left - left-overs instead of winter-overs. Since the 12th I'm the only one. Unfortunately we had some major problems with our telescope and some of the electronics on the focal plane is fried beyond repair, due to problems with a power supply. Fortunately it happened now 2 weeks before the decommission of the telescope, but it would have been nice to do the last calibrations.